← FantasyCon2011: it’s nearly here!! “In 1348, England is stricken by the Black Death. The worst pandemic in human history has reached the kingdom of the warlike Edward III, a monarch who, in battle against human adversaries, cannot imagine defeat. Two thirds of his subjects now perish. Woods become wild again, farmland goes to rack and ruin, villages, towns and castles are left empty, inhabited only by ghosts. Little wonder that fear of the supernatural reaches an all-time high. Little wonder stories ignite about witches and demons spreading the plague, about ‘King Death’, an awesome harbinger of doom from whom there is no protection. 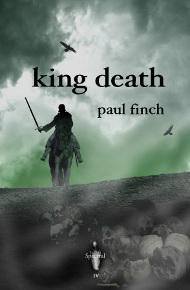 So runs the back cover blurb for the fourth volume in Spectral Press’ acclaimed series of chapbooks, Paul Finch’s medieval tale of misplaced hubris, King Death. Originally, I had intended to put it on preorder after I’d returned from FantasyCon but, since there are only TEN (10) copies left before it’s officially sold out, I’ve decided to do it now instead. Each copy will £3.50UK/£4.50EU/$8USA & Canada/$12RoW. So, if you want a copy, it’ll be on a first-come, first-served basis – if you ARE wanting one of these, wrapped in a stunning Neil Williams cover, then please contact me at spectralpress[AT]gmail[DOT]com as soon as you can – I will then advise you on its availability and how to pay (if there are any left). Which brings me to the subject of subscriptions – there are also TEN (10) places left on this Volume – if all copies of King Death have been sold out and you send money for a subscription it will start with Volume V, Simon Kurt Unsworth’s Rough Music. I do strongly recommend that you consider signing up for a sub, as this is the best way to ensure you don’t miss out on future issues. Just click on the appropriate Paypal button on the right-hand side of this page to order one – it’s as simple and easy as that!